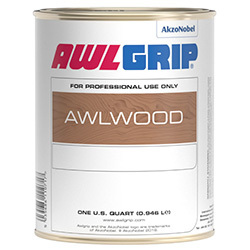 Awlwood MA is an exterior clear system that is made up of a Primer and Clear Finish (available as satin or gloss). By combining the Primer and Clear together, the synergistic effect results in an outstanding system that adheres and bonds directly to the wood's cellular structure, giving extended performance and retaining the same gloss and natural appearance as first application. Note: Occasionally some timber extracts can retard the cure of primer. Test on small areas if unsure.